The amount of bathing and grooming your pet needs depends on the breed, lifestyle and personality of your pet. Pets that spend time outdoors usually need to be bathed more frequently than strictly indoor animals and pets with long, silky hair need to be groomed more often than pets with short, smooth hair. But you can always tell it’s time by feeling (and smelling) the fur; an oily or matted feel means it’s time to give your pet some attention. Why Bath and Groom Your Pet? There are more reasons to bath and groom your pet than just for aesthetics and for your sense of smell! Bathing also helps with flea infestations and gives you a chance to check for bumps, sores and skin irritations. Grooming helps get out and tangles and stops your pet’s fur from becoming matted by removing dead hairs and spreading naturally occurring oils throughout the coat so it stays shiny looking and healthy. Nail clipping keeps the scratch factor down and your pet from getting caught up in the carpet! Ear cleaning stops buildup and health conditions from occurring. Grooming and bathing your pet on a weekly basis has also been proven to cut down on allergic reactions by reducing the amount of dander in the air. You should always groom your pet before bathing since grooming untangles knots which are far more difficult to deal with when the fur is wet. There are numerous styles of brushes and combs for all different lengths and types of fur so have a chat with the pet store personnel or a groomer before buying your grooming gear. Give your pet lots of attention and reassurance when you start grooming to ease any feelings of fear. When trimming mats out of your pet’s coat, keep the points of the scissors facing away from the animal so no accidental scissor stabbing occurs if your pet becomes nervous and jumpy. You can use a bit of cornstarch sprinkled onto a mat to help with grooming it through and mineral oil to dissolve sticky spots on your pet’s fur. Places to pay particular attention to when looking for tangles, mats and food stuck in fur are around the eyes, mouth, tail and in between the toes. Be careful of sensitive areas on your animal that may cause a reaction when touched, like the stomach on many cats. Before you begin to bathe or groom, make sure you have the area you’ll be working in set up for your session with your pet, keeping a wet pet in the bath can already be quite a chore without making it harder by having to get up and grab something part way through! The water temperature shouldn’t be too hot, just above room temperature is what’s comfortable for most animals. Always use a pet shampoo as these are specially formulated to work with the PH balance and natural oils on the skin and fur of your pet. Using a conditioner as well cuts down on shedding skin flakes and allergic reactions. Start at your pet’s head and work your way down from the cleanest areas to the dirtiest. If your pet is really filthy, you may need to change the water part way through! If your dog is dismayed by the sight of the bath or your rabbit runs at bath time, one of these factors may be the reason. Bathtub discomfort: is the receptacle you’re washing your pet in too large or small? Choose a bath that is right for the size of your pet. Do you have an anti slip mat to stop your pet from sliding around and getting nervous? If not, you can put a towel down in the bottom. Are you filling the bath too full? Water should only come to about the knees of an uncomfortable animal so they can still maintain their balance and grip. 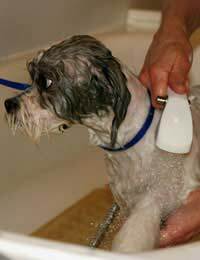 Fear of the water spray: never spray your pet in the face with the shower nozzle as this scares them. Use a squeeze bottle filled with water or pour the water over with a cup or bowl instead of the shower head. Running water can also be a problem so fill the bath beforehand so the sound doesn’t startle them. Escape artists: make sure your bathing area is completely confined and the door is shut so your wet pet doesn’t go streaking through the house. You may need to restrain your pet with a towel or even a mesh laundry bag, though this will definitely result in an upset animal! Have some treats on hand to reassure your pet and reward for good behaviour, with patience and positive reinforcement even the most resistant of animals will eventually come round.